Tags: Dominik Panka, EPT Malta, Javier Gomez Zapatero, Jean Montury, Valentin Messina. 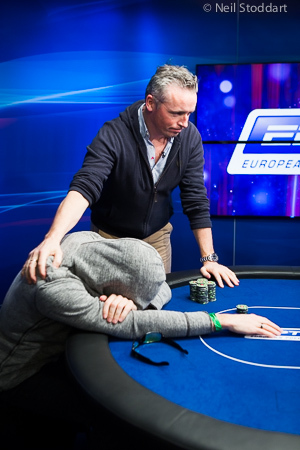 Both players took the heads up very serious, and it ended up being a very long battle for the extra €100k and the title. Montury took down most of the pots in the beginning and generated a lead that suggested that he would win the battle rather easy, but Messina doubled up at least three times to extend play long into the early hours, which forced tournament officials to shorten the levels. They got it in before the flop: Messina with 55 against Montury's A10. The board ran out 6 J J 4 6 and Montury's big ace won him the pot. An epic final hand to say the least. "The heads-up was so long because we both wanted the trophy and wanted to win so much," Montury said. "It was so hard to beat a man like Valentin, because he is a very good player. It's hard for him, but we need one winner." EPT Malta High Roller: 289 Entries So Far! 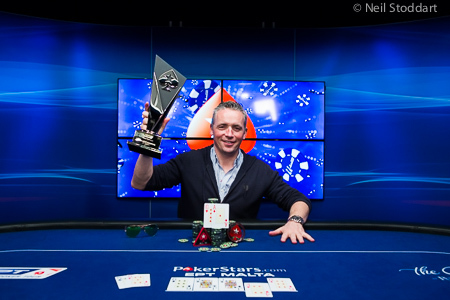 4 comments for "Jean Montury Wins The First Ever EPT Malta Main Event"
I want to congratulate him, but for what i saw in the final table i can´t, because i didnt like the way that he play, and not him, the other françois too, but they reach the head-up and one of them win, after a very long time on the head-up. And be the first time EPT manin event winner on Malta is a good felling, so i will wait to see what he will be doing in the next months. Looks to have been a great heads up battle for the title.Must be a strange feeling when you know you have already won half a million but an extra 100k is well worth going for.I can't remember the last time there were two french guys dominating a final table. I want to congratulate him, but for what i saw in the final table i can't, because i didnt like the way that he play, and not him, the other fran&#65533;ois too, but they reach the head-up and one of them win, after a very long time on the head-up. It's not like poker is a beauty competition.